That is amazing! A couple of my friends have painted their laminate counters, but they didn't go for the stone look. I love yours. You did a fantastic job!! I love it! I really should do this on my kitchen counters, but I am a little nervous...plus I am not sure Hubby would be down with the idea. WOW! It looks great, and like you say for that price...no stress! I love the finished product!! Thanks for the step-by-step and the thrifty ideas!! That looks great. You did a great job explaining everything! Awesome! We've been talking about painting our laminate. That looks fantastic. I'm tempted to paint my kitchen counters but I'm afraid they won't hold up to the wear and tear I put into the kitchen. Oh My Gosh!! This looks GREAT!! I had looked at the new countertop paint by Rustoleum, but it is so new, there are no reviews!! You saved me with this post!! thank you so much!! That looks great! I just saw another post recently where someone did their kitchen counter like this to look like granite & she poured that clear material they use on bars over it all. I love this look! Great job. Do you mind me asking you what 3 colors you used on your countertops? What an amazing difference! The counter top looks great. I hope that's not true about the poly over latex...yikes! I used it over my coffee table and it worked OK. Breathe Sarah. Polyurethane is just fine over latex paint. I cannot imagine why any knowledgeable paint salesperson would tell you otherwise. I have been doing painted furniture for years using latex paint and finishing with polyurethane. Love your explanation here...I would love to do my ugly counters. I actually took a two-hour class years ago on painting laminate. The class made me afraid to try. Hello! That's beautiful! I just arrived via Hooked on Houses. Love what you are doing! Nice work and an excellent step-by-step guide. I'll share this! I love the nice subtle stone look you got! I painted my laminate kitchen countertops recently and I encourage everyone to go for it! You will be so glad you did! Great Tutorial! I had painted a counter top 6 -7 years ago (an island in the kitchen) and with Melamine Paint..and it takes all kinds of abuse. That looks great! We recently replaced our old laminate but I wish I would have tried this for fun on them. Thanks for sharing! This is awesome! You did a fantastic job - and you've detailed your work so well that you've made it really easy for the rest of us. I hope mine turn out half as nice as yours. Thanks again for sharing! Your bathroom looks wonderful! Was it hard to remove that big builder mirror? I have those in my bathrooms and would like to remove the big one and replace it with a smaller one. I hope you have better luck than we did. We bought our house not realizing the countertops were painted and sealed with poly. After a few days of doing dishes and not being totally diligent with wiping up any and all water drops the wet areas discolored and began to bubble up. I tried sanding the paint and poly off and using a stripping compound to no avail. I can get the finish down to the white primer, but it is a terrible mess. I ended up paying $7 for 3 rolls of contact paper in a granite design and just recover my counters for another $7 every 3 months. Ugh. I called the previous owners and they said they used primer, latex paint and 2 coats of poly. I am going to try this u did a great job. Showed my husband he thought it was cool too. Will let you know the outcome. Hi! :-). Great job. I live in a 30-yr. old, completely remodeled apt. (used to be parties here in high school, but that's another story..:-0). Anyway, my point was that there used to be hideous 70's DARK ORANGE laminate countertops in the kitchen. During a complete remodel, they "painted" the kitchen counters with what I think is garage-floor paint, or hard, epoxy-based paint. Sounds weird, but for not being actually NEW counters(the awful orange lurks beneath ;-)), it looks surprisingly decent/acceptable for an apt. I think they sell the stuff at HD. You might try it. Mine's very dark grey, almost black, with specks of lighter grey and white. I don't put really hot stuff off of it (trivet), and just clean with Trader Joes green liquid cleaer, but it seems to be pretty tough. I am going to give this a shot. We have very ugly dark green laminate countertops in the 1832 house we bought last year -- the kitchen was "redone" in 2004 with stuff that is right out of Condo 101 from 1984. Can't afford to re-make the kitchen yet, so I figure we don't have much to lose by trying small fixes. Is yours still holding up well? You did an excellent faux paint job! Your counter tops look great! I am trying to decide whether I should do this or not. Granite estimates are coming in around $3500 for my entire kitchen, I just can't seam to swallow that bill!! My counter tops are seriously gangrene colored and I just can't stand it anymore. The rest of the kitchen is beautiful and I just got new stainless appliances, which seriously bring out the ugly laminates!! I was going to spray them with a paint by Rustoleum that creates a hammered subtle almost Wilsonart HD look, but after trying it outside on a piece of wood, I decided it makes too big a mess with spray going everywhere, and it says to use it outdoors only- not sure how I would seal off everything in the kitchen. So I think I'll try your sponging several colors method, I'm nervous, but you gave me inspiration! Wish me luck, I'm headed to Lowe's to pick out paint. I also found this really cool stuff called Giani Granite Countertop Paint. It is a numbered paint system that makes your countertops look like realy granite. I saw it on the local morning shows. My friend apparently saw the same show I did and bought it...it looks awesome and it came with everything you needed including the sponges, rollers etc...The look is natural and everyone comments on it when they see it. I'm not quite sure how I came across your blog, but I LOVE it! I would love to subscribe, but can't figure out how to do it. HELP! Marble Countertops are among the most beautiful and durable countertops on the market. Wow, that is fantastic! Who knew you could paint that. What a nice inexpenive way to update!! Came over from Remodelaholic. Thanks for sharing! AMAZING!!! I have fugly laminate in my ktchen and would LOVE to paint it. Thanks so much for the inspiration and encouragement to try it myself! Granite Countertop create a very durable. Granite is an excellent choice for countertops. Granite is available in polished and matte finishes. While granite may be more expensive than some other materials, its longevity adds immeasurable value. So it's quite a bit later now, how are your countertops holding up? I'm dying to do mine, but REALLY nervous it will all chip or flake off and then I'll be stuck with worse than I started! How are yours now?? I bought a bombay black kit from Giani granite paint for countertops. I applied the mineral paint with a plastic bag instead of the sponge that it come with and it gave my counters more of a marble look. The kit only costs $60.00 dollars and my counters are holding up great! BLESS YOU for having such detailed instructions! Your blog is my new best friend. I have similar countertops that I need to re-do for the time being and you just gave me the courage to do it myself! Fantastic job! Looks great! What they told you about mixing oil and laytex is true, its like mixing oil and water. Sure it CAN be done, but it's going to cause problems. That's why you hear people who do this end up using a blowtorch to get the bubbles out. A lot of people also have a problem with it peeling off easily-duh, they don't stick together! Even if you don't see these things immediately, they will happen over time. If you're going to use laytex paint, use a laytex base primer. If you use oil base, make sure the top coat is too. My husband is paint manager and people do this all.the.time. After he tells them what most likely will happen and tells them that they both need to have the same base, he informs them that there will be no refund if they're going to mix two differently based paints. DONT DO IT! Hey...I know this is an old post for you but I'm wondering how this counter held up over the last 2 years? It looks great! A matter of fact, I did paint my ugly laminate countertops with your advice and they came out great. Thanks for the help. Perennially popular and practical, low pressure laminates represent an attractive, versatile and low maintenance option for vertical kitchen surfaces. Less durable than high pressure benchtop-specific laminates, low pressure laminates can nonetheless withstand the rigours of most domestic kitchen usage. Love this! I like the technique so much better than the sponge-painted look. I like that you used latex paint as well. Please tell me this held up. First time reader! I'm so happy I could cry! I have been looking for the longest time trying to find a solution to redecorate my 51-year-old bathroom without replacing the sink and cabinet. This is the first post on your blog that I have read. Do you have anything about painting the floor tile? Thanks so much! Amazing work and great explanations. I so appreciated. Will repaint my kitchen cabinets in white (right now it's that light cream color) and the counter tops... gosh pinkish. I hate it! Your faux paint work is a fantastic idea with beautiful results. I know for sure what's my next project. Thank you! I have used this technique on a concrete floor in my living room, except instead of paper towels I used plastic bags on a paint roller. You just have to be careful to use verrrry small amounts of paint after the base coat, just spread it around good with the plastic. I also used a clear garage floor sealer that has held up great. Hi, I came across this post by accident and I'm about to give it a try. How have they held up? Hi! How is the countertop holding up? i"m thinking of doing the same. How is the counter top holding up? I"m thinking of doing the same. WOW ... You did a beautiful job! We were searching for something on faux finishes for walls in the kitchen and stumbled across your blog. You are very talented -- and far braver than us. We refinished our laminate countertops in the kitchen a while back with a natural stone stone coating that you roll on like paint. It was called the SpreadStone Countertop Finishing Kit from a company called Daich Coatings. For anyone wanting info on that, visit www.daichcoatings.com. We are going to try your faux process on a section of wall. You made it look so easy! Did you use a brush for your base paint? Are they still holding up? I see that you originally posted this in 2009 & I'd love to know if they still look as great or if you've had any problems...? 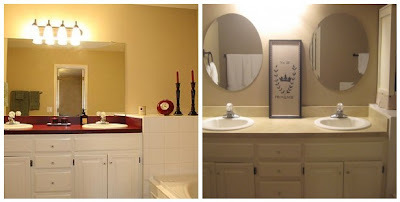 Love all the ideas for countertop transformation you shared. I read your post. It is very nice and useful. I was sure you could paint oil over water-based but not vice versa because water evaporates but oil doesnt. I didnt think water-based would stick to oil. But everything Im finding says the opposite, maybe because of the properties of latex etc...shows what I know....Ok I just saw the year of the post...so...what's the verdict? :) Anyway....it looks great!! This is what I want on internet. Very informative blog.